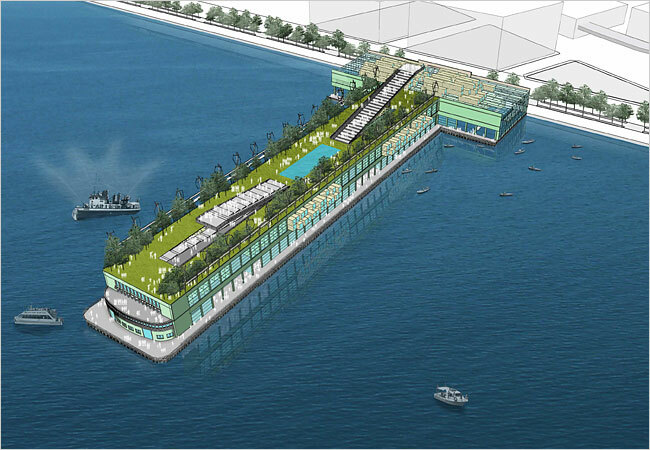 Will the Trust cancel the Pier 57 RFP on January 31st? Developer Steven Witkoff has withdrawn from the development of Pier 57, putting an end to the estimated $400 million project that would have transformed the old waterfront into a landscaped public space replete with a bridge to the High Line, a marina, a museum, and a gourmet banquet hall. Last week, the Witkoff Group alerted the Hudson River Park Trust — a state and city agency charged with developing the 5-mile Hudson River Park — that it was formally withdrawing its involvement. The project has been marred by delays centered for the most part on the Witkoff Group's involvement in the Manhattan district attorney's investigation of a former chairman of the New York Republican County Committee, James Ortenzio, who is also a former chairman of the Hudson River Park Trust. In November Ortenzio pleaded guilty to a felony tax violation and failure to make a financial disclosure under the state's Public Officers Law. The Ortenzio investigation by the DA did affect the Trust's willingness to conclude the deal. The trust wanted to know that the RFP process was beyond reproach," Mr. Witkoff's government and community relations adviser, James Capalino, said. "And the investigation to the best of my knowledge did not find any problems with the RFP process and was judged, by everyone, to be ethical." Mr. Witkoff's decision to withdraw involvement now forces the Hudson River Park Trust, which initially awarded the project to a partnership of Mr. Witkoff and the Cipriani restaurant three years ago, to start from scratch. The park's overseers, the Hudson River Park Trust, have sought to leverage private sector money to rebuild and open to the public the crumbling piers that stretch out into the river. A decision about how to develop Pier 40, near Houston Street, is stalled due to community concerns regarding a plan by the Related Companies to build a permanent New York City home for Cirque du Soleil. A decision is expected soon. In court, park advocates have been trying to oust the 30th Street Heliport on the grounds of excess noise and noxious fumes. NEW YORK CITY-Hudson River Park Trust chair Diana Taylor and president Connie Fishman today revealed that there is currently $170 million of construction activity now happening at Pier 25, 26, 62, 63, 64, and 86 here, and it will soon undergo a surge in construction--with the goal of completing 80% of the park by 2010. An additional $110 million in activity is expected to start in the coming months. The major sections of construction activities currently are in Tribeca and Chelsea. Early this summer, the newest section of the park, running from Laight Street in Tribeca up to Houston Street will open to the public, and another new public pier in Chelsea is expected to open by the end of the year. The Tribeca section of the park was built with $70 million in funds obtained from the federal government through the Lower Manhattan Development Corp. to assist in New York City’s recovery from the 9/11 attacks, as GlobeSt.com previously reported. The Tribeca section will include a playground, practice recreation field, mini-golf and snack bar, beach volleyball courts, historic ships, mooring field , skate park, basketball, comfort station, boathouse and waterside café, an estuary research center, dog run, tennis and public art. A mile-long waterfront esplanade will offer native grasses, trees and gardens, landscaped seating areas, and a seaside boardwalk. The northern half of this section will open this summer, according to Taylor. 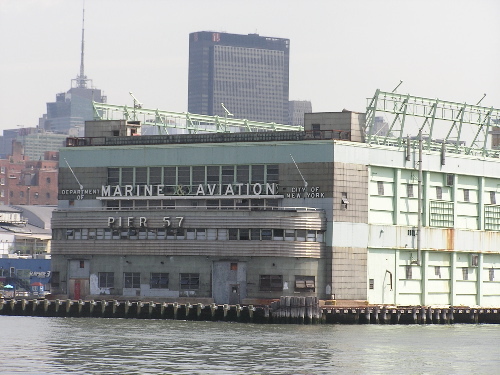 For decades, Pier 57 has been more vestigial than commercial: A onetime engineering marvel, it was relegated to serve as a waterfront bus garage and maintenance facility after the 1960s, when large passenger and freight ship traffic waned on Manhattan's West Side. The proposals by the developers — Related Companies, Youngwoo & Associates and the Durst Organization — will be unveiled on Thursday in the second attempt in five years to create a commercial operation that would generate revenue to maintain Hudson River Park, the five miles of waterfront running from the Battery to 59th Street. The firm is also proposing a large public market akin to Pike Place near the Seattle waterfront, with restaurants, food stalls, craft importers and dress and jewelry designers. The third fixture, a large rooftop hall, would serve as a theater for the Tribeca Film Festival, which would also present events year-round. 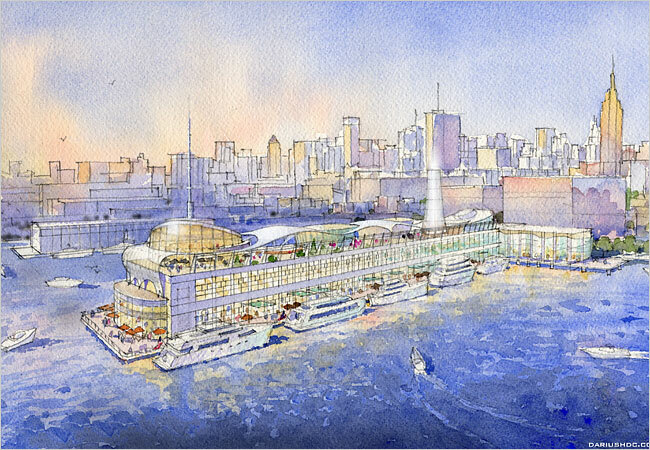 There would also be a parking garage in one of the caissons and an underwater discovery center with interactive exhibits about the Hudson River estuary. What is it with stairways to nowhere these days? Then again these ones would probably provide stunning views all around. As expected, the Hudson River Park Trust designated Youngwoo & Associates as the developer to turn Pier 57 at 15th Street into a rip-roaring New York City waterfront attraction—one that can generate some revenue for the upkeep of Hudson River Park. We're cautiously optimistic! It's not that we don't enjoy the Youngwoo bid, with its green space, canoe docks, Tribeca Film Festival venue and "Underwater Discovery Center." It's that if we've learned one thing about the commercial development of the Hudson River piers, it's this: Don't hold your breath. The "Leonardo" plan for Pier 57 fell apart in early '08, and Pier 40 is a total shitshow. But, heck, it's a joyful day so we'll stop raining on the parade. 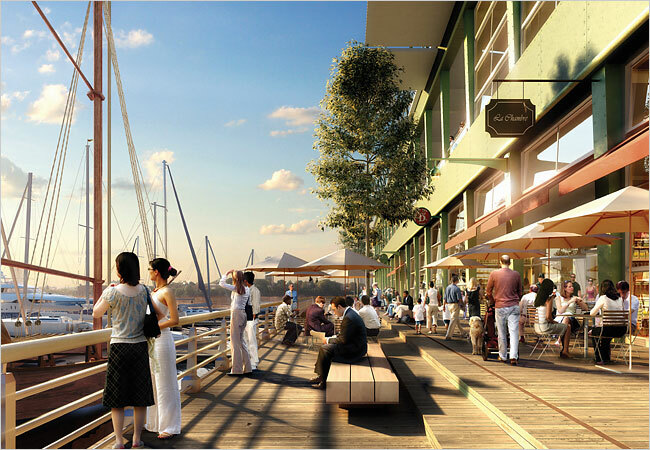 Above, a pair of new renderings of Youngwoo's shipping-container-chic plan (designed by LOT-EK), combined with some previously released early looks. And hey, what's with the Koons? UPDATE: Just added to the gallery, new views and renderings of the plan, including the five total acres of new public park space from those zany Dutchmen at West 8 (of Governor's Island fame) and more shots of the interconnected container modules. Also, check out this fly-through video if you'd like a soundtrack.